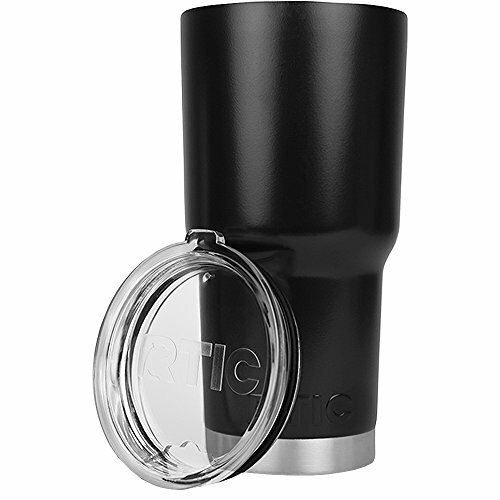 SHOW YOUR COLORS WITH RTIC's 30 oz TUMBLER - AUTHENTIC BLACK. The distinctive stainless steal bottom cap creates a clean, stylish look. It's FROM RTIC (and not from a 3rd party coloring/reselling vendor). VACUUM-INSULATED, SWEAT-FREE PERFORMANCE - HOT STAYS HOT, COLD STAYS COLD. Two walls of steel (and a vacuum in between) create great insulation for the perfect temperature because who wants a sweaty cup or a watery drink or lukewarm coffee? TOUGH FOOD-GRADE 18/8 STAINLESS STEEL WITH A SHATTERPROOF CLEAR LID - rugged, durable, well built to withstand the destructive forces of life and repel any lingering flavors. Perfect for hot coffee in the morning and cold cocktails at night. A HIGH-PERFORMANCE, STYLISH TUMBLER IS ONE OF LIFE'S NECESSITIES - like favorite shoes that keep your feet feeling perfect. So care for your drink throughout the live-long day.